Thank you so much for suggeting Valentin Imperial Maya Resort. We have just returned and LOVED our stay. We were pleasantly surprised when they upgraded our room to a Golden Jr Suite and we had only booked the Deluxe! Thank you for taking the time and requesting that! The rooms we very nice, the staff was great and the food was incredible! I really liked that we never had to make any reservations, we just went where we wanted, when we wanted! We spent most of our time on the beautiful beach but also enjoyed the pool and swim up bars! Thank you Mexico Vacations & Valentin for making our Anniversary trip so memorable! We will recommend it to all our family and friends. We look forward to another great trip next year! 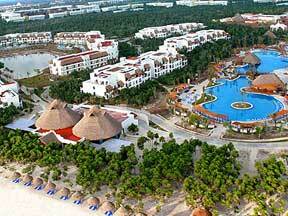 VALENTIN IMPERIAL MAYA - Just 20 minutes from Cancun’s International Airport, Valentin Imperial Maya sits on a half-mile-long stretch of white sand beach of Playa Del Secreto (The Secret Beach) in the Riviera Maya. This all-inclusive, adults-only magnificent all-suite resort not only gives you direct access to the beach, but also places you just minutes from the vibrant culture of Cancun and the world famous Mayan archaeological sites such as Tulúm, Cobá, and Chichen Itzá…. all while keeping itself secluded from the clutter. Seven à la carte theme restaurants, and six fabulous bars including 2 Swim-Up Pool Bars will delight your senses and satisfy all your culinary desires. Amazing spa and spa garden, offering outdoor and indoor treatments, Jacuzzis, state-of-the-art fitness center and premium cocktails ensure that guests are pampered and indulged. Come and enjoy ! Valentin Imperial Maya is an All-Suite hotel with each of the rooms overlooking the beautiful natural gardens, salt-water pool, natural lagoon or the Caribbean Sea. Get a welcome cocktail at our private check-in. The luxurious suites are located in two- and three story villas (Deluxe Junior Suites, Golden Junior Suites, Oceanfront Junior Suites and Diamond Suites), and enjoy an array of exclusive amenities including concierge service, 24-hour unlimited drinks and snacks, an oversized Jacuzzi, a pillow menu for a good night sleep, free high-speed Internet access and much more. Handicap-accessible rooms are available. GOLDEN JUNIOR SUITE - Same as Deluxe & Silver Jr Suite but also includes 2 TV's, 1 LCD Satellite Television with premium and adult channels. 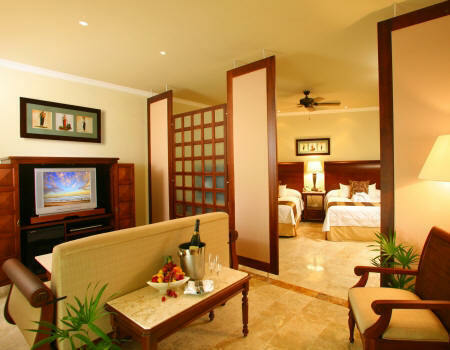 Located on the 2nd and 3rd floors of the Golden Section Building, these rooms face the swim up canals & natural lagoon. Most have partial ocean views. 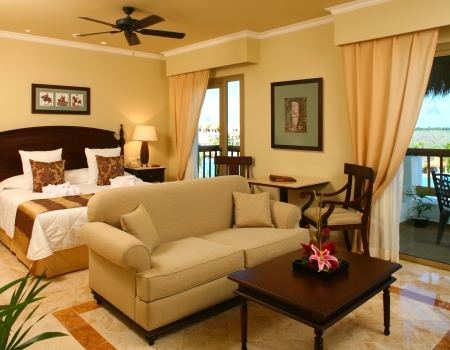 Golden Jr Suites are located in Towers 6, 7 & 8. .
GOLDEN JR SUITE SWIM UP - Same as Golden Jr Suite. 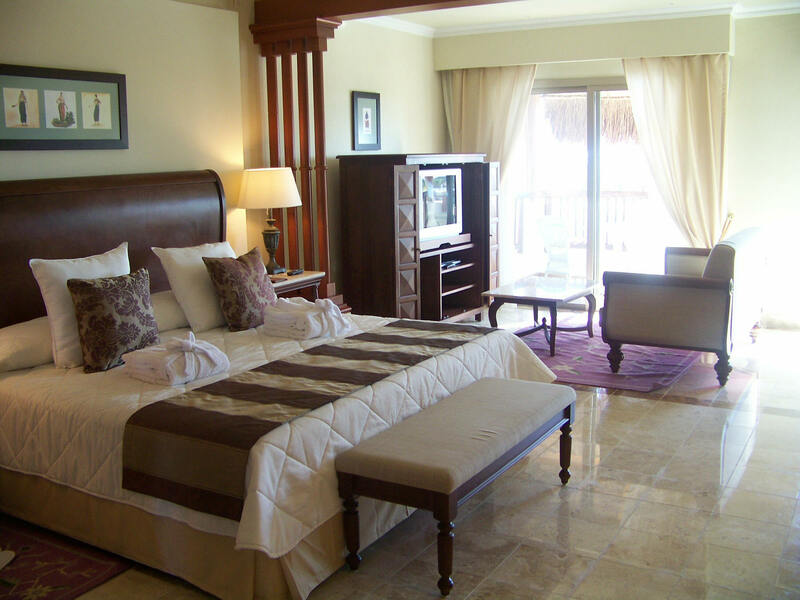 These rooms are located on the ground floor with direct access to the swim-up pool. Lagoon & Obstructed Ocean Views. Many have a divided, more private living room and some are arranged as above, where the jacuzzi is prominent in the room. 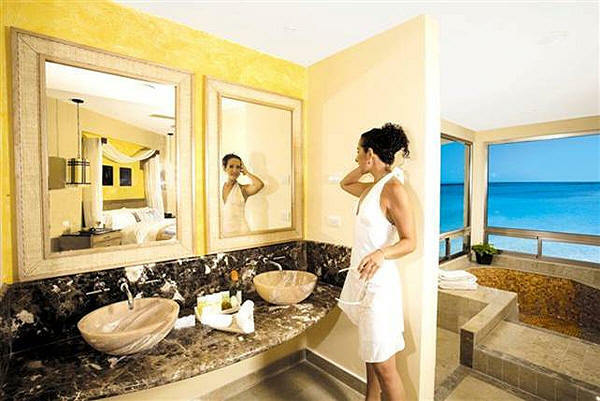 OCEAN FRONT JR SUITE - Same as Deluxe Jr suite but OCEAN FRONT and also includes a Beachfront roman-style sunken jacuzzi tub with direct access to the terrace or balcony. 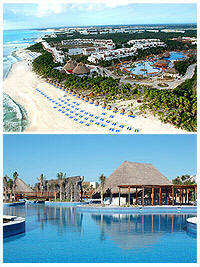 The ocean front buildings at Valentin Imperial Maya are 2 story. 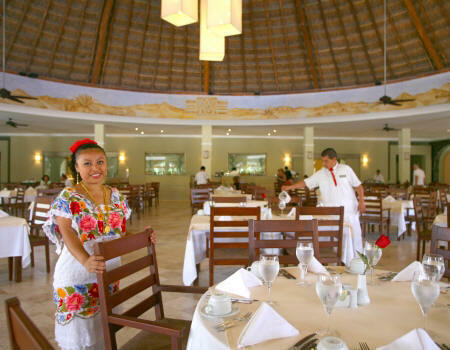 As a guest of the Valentin Imperial Maya, why not treat your palate to a culinary adventure as well? Enjoy your culinary experiences in a modern and trendy atmosphere with dishes crafted by internationally renowned chefs. 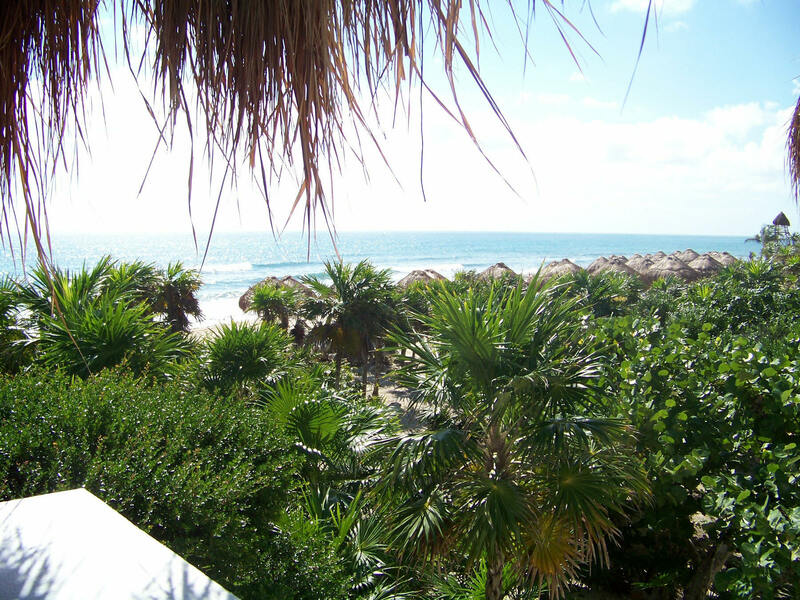 Start your day with a tasty breakfast in the Beachfront à la carte restaurant, where you can also enjoy lunch. 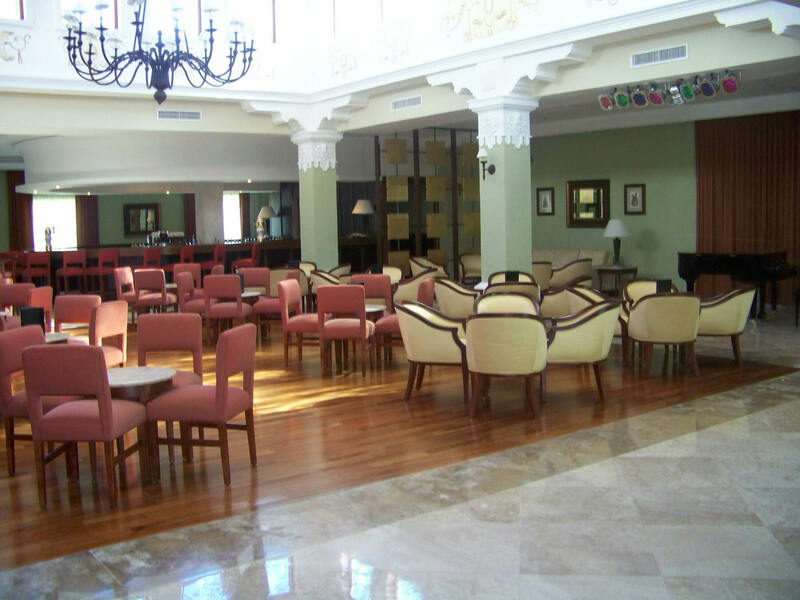 For casual dining, the main buffet restaurant is available for breakfast, lunch & dinner. Or you may select any of the seven à la carte restaurants. 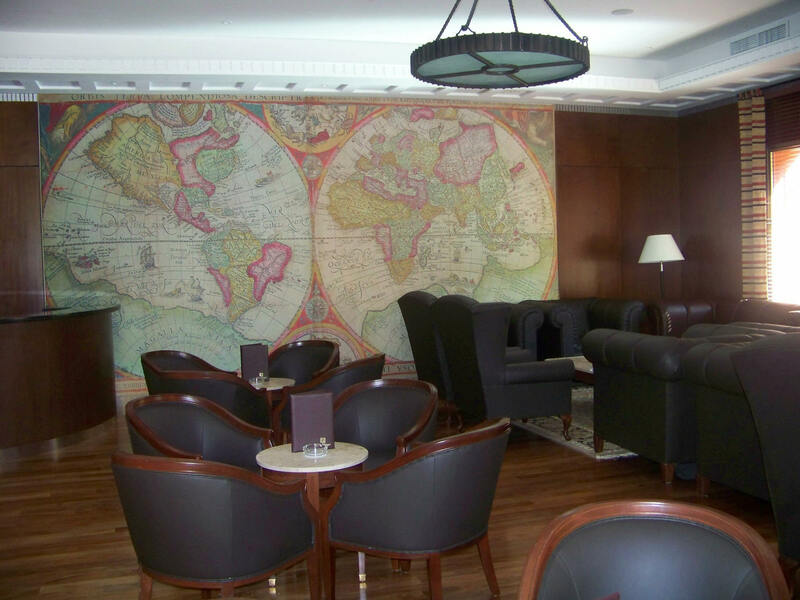 Restaurant Le Marché Specializing in international dishes, the enchanting “Le Marche” opens its doors 7:00 am - 6:00 pm. Because of its spaciousness, it is an excellent choice to have lunch with a group of friends. This restaurant has a shortened menu available in addition to the theme being offered. *Le Marché does not open for dinner. Il Olivo - Gourmet Italian Inspired by traditional dishes and new Italian-American cuisine; using authentic, prime-quality ingredients. 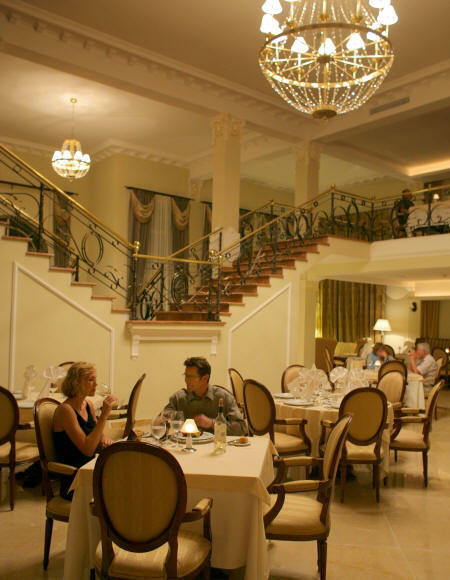 L'Alsace - French Restaurant Classic traditional French cuisine. Before your dinner don’t forget to visit our extensive wine cellar and make a selection from among some of the finest wines in the world. Ginger - Asian Restaurant offer Sushi Bar - Tepanyaki Tables & A la Carte Dining - based on traditional and contemporary Japanese cuisine with some Peruvian influences. La Hacienda - Mexican Restaurant is based on traditional Mexican gastronomy with a contemporary touch from three of our country’s different states—Veracruz, Puebla and Yucatan—avoiding excessively spicy flavors. Restaurant Tierra - Steak House Enjoy excellent American Angus certified cuts, choice and prime quality, with American-Argentinean side dishes and dressings prepared on our grill in an open-air atmosphere. It’s the perfect place to enjoy an intimate candlelight dinner, giving you a panoramic view of the Caribbean Sea. Restaurant Mar - Seafood Restaurant We offer an inspired, detailed selection of fish and seafood with influences of New Orleans-Cajun, Mexican Veracruzian, Peruvian and Caribbean-style cuisine. Lobster Pot - Enjoy the authentic taste of our Caribbean spiny lobster in a restaurant overlooking the sea. Dress Code: For gentlemen: We recommend long pants however dress shorts or bermudas are accepted. Dress shirt, casual shoes or elegant sandals must be worn. For ladies: Long pants, capri pants, skirt, blouse, casual shoes or elegant sandals must be worn. No shorts, beach sandals, tank tops or t-shirts will be permitted. Room Service If you prefer privacy during your dinner, Room Service is always available. You may occasionally experience a brief wait between 7:30 pm to 8:30 pm for the restaurant of your choice, however, our Restaurant Managers will be pleased to write down your name, inform you of the approximate wait time, hand you a beeper and invite you to enjoy a relaxing cocktail or beverage until a table is ready for you. Dress code: Casual shorts, bermudas, sarong pareo and t-shirts are welcome. No shorts, beach sandals, tank tops or t-shirts will be permitted. Dress shoes, casual shoes or sandals must be worn. No bare feet, please. Dress code: For gentlemen: We recommend long pants however dress sh orts or bermudas are accepted. Dress shirt, casual shoes or elegant sandals must be worn. For ladies: Long pants, capri pants, skirt, blouse, casual shoes or elegant sandals must be worn. No shorts, beach sandals, tank tops or t-shirts will be permitted. 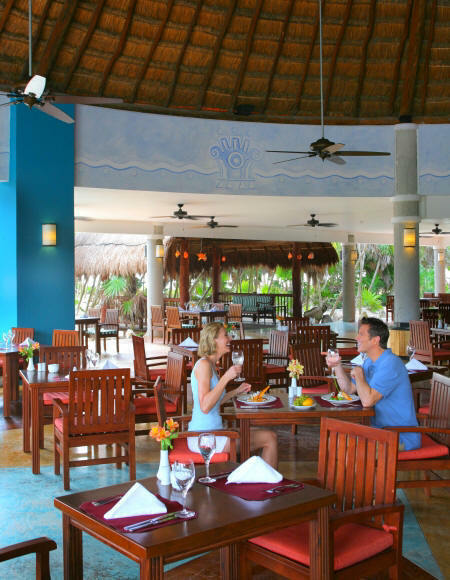 La Plaza Strategically located in our Mexican Plaza, it is the ideal place to begin a romantic evening. In true luxurious lifestyle tradition, you'll write your own agenda, whether it’s a relaxing stroll along the beach at sunset, a calm early afternoon by the pool, enjoying our nightly show at the fully air-conditioned theater, or dancing the night away underneath the starry Caribbean night sky. An exciting mix of watersports are also available for those who want to explore the seas, including kayaking, snorkeling, diving ($) and more. State-of-the-art Fitness Center - The on-premise, state-of-the-art fitness center provides a full range of activity and exercise equipment, including treadmills, lifecycles and step machines. World-class Spa and Spa Garden - The Spa at Valentin Imperial Maya, a place to discover your senses.